For COACH TRAVEL please click here. National Express runs a direct coach service between Bristol Bus Station and the festival coach station. Fares can be booked on the National Express website or by calling 08717 81 81 81 – 24/7 (calls cost 10p per minute). 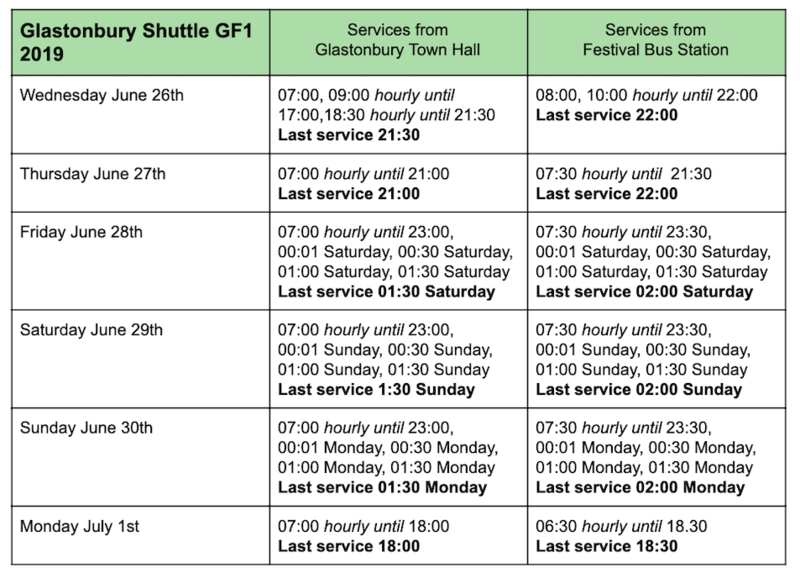 Below are details of 2019 bus services to Glastonbury Festival Bus Station. Take the 376 bus from Bristol Temple Meads to Glastonbury / Wells and connect into the festival bus services from Glastonbury (GF1 Wed to Mon) or Wells (GF6 Fri to Mon). For GF1 and GF6 timetables and fares, see below. 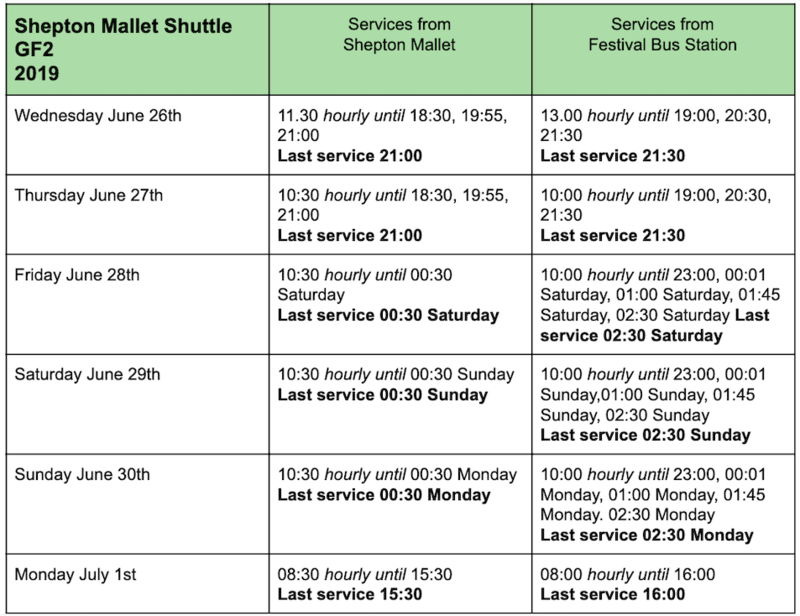 Take the 174 bus from Bath Bus Station to Shepton Mallet and connect into the festival bus services from there (GF2 Wed to Mon) timetables and fares, see below. There’s a free shuttle bus for Festival ticket-holders running between Castle Cary Station and the Festival Bus Station throughout the Festival. The bus station is next to Pedestrian Gate A. 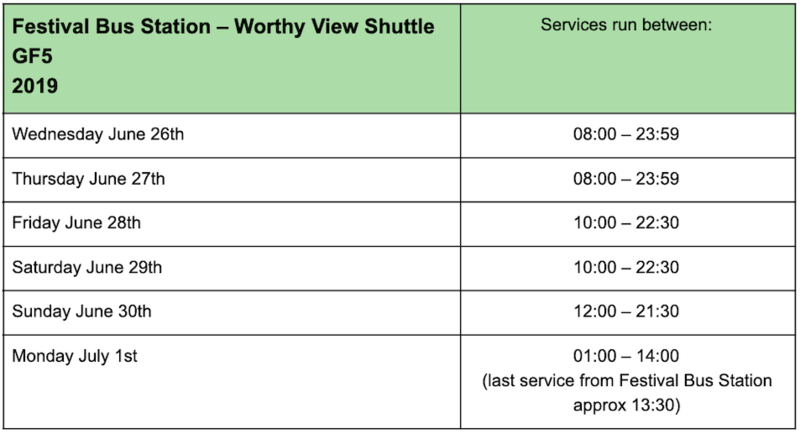 The shuttle operates from Wednesday to Monday (there is no service during the night when trains aren’t running). Remember you will need your Festival ticket to use the bus service to the site. From 12:00 each day this calls at West Pennard bus stop, 10 minutes after departing from Glastonbury Town Hall. Shuttle between Castle Cary Station and Worthy View. This is a free service for guests staying at Worthy View. This service will operate on Wednesday & Thursday, Sunday & Monday to connect to and from rail services. Shuttle between Festival Bus Station and Worthy View. This is a free service for guests staying at Worthy View. The service operates from Wednesday to Monday. Calls at North Wootton (Crossways Hotel) 15 minutes after departing Wells Coach Station.